After my 8 mile run tonight, I looked at my gps watch noticing that I had moved 18,724 steps…seeing that number on the face of my Garmin I wondered where these steps had taken me. And more importantly where are they taking me? It’s not the steps…it’s the result. One step from hurt, anguish and regret. One step closer to restoring relationships. One step further away from mistakes. Closer to where we can stop running from the ghosts of our past. @cledawgs points out you’re only ONE step away from, love, health and the new you. One step closer to someone who loves you. One step nearer the new you that you want to become. One step closer to open arms. Life is not made up of major movements. Few things in this world can be corrected changed or their course diverted with one massive, singular, course changing movement. Most victories, battles, and achievements are set into motion by taking one step. This entry was posted in Uncategorized on March 25, 2017 by burk.brian@yahoo.com. Running the Boston Marathon is a goal for some, for others it’s about LIFE and DEATH. Ryan Robertson’s story about both. March of 2010 seems like an eternity ago, but it’s a month I’ll never forget. I was feeling great, training for some summer races, and had a week long rock climbing trip planned to Nevada at the end of the month. After going out for a run one day, I noticed that the left side of my face felt slightly numb. After a few days of increasing numbness, I checked in with my doctor who suggested an MRI. Feeling completely confident that it would turn out to be nothing, I was shocked to learn that, at the age of 25, I had a type of brain tumor called an acoustic neuroma. Even more devastating, was finding out the tumor was nearly the size of a tennis ball. In less than 24 hours, my general practitioner contacted Dr. Allan Friedman at Duke, considered by many to be the top brain surgeon in the world. As you can imagine, Dr. Friedman is incredibly sought after and busy. He wasn’t taking any appointments that day, but after seeing my MRI, agreed to meet with me right away. Two months later I underwent brain surgery with Dr. Friedman and another world renowned brain surgeon, Dr. Fukushima, who happened to be teaching as an adjunct professor at Duke. The surgery was scheduled to take around 6 hours but ended up lasting 13 as the doctors worked with meticulous precision trying not to damage nerves that could have left the side of my face permanently paralyzed. Thanks to their skill, expertise, and precision I came out of the surgery with great results. The entire team that worked with me at the Duke Brain Tumor Center was phenomenal. Within a couple months of surgery I was back to running, rock climbing, and working my way through graduate school classes. I’m incredibly thankful for the results of my surgery, but unfortunately, being diagnosed with a brain tumor doesn’t always end the same way. I consider it a great privilege to be able to run the Boston Marathon and raise money on behalf of the National Brain Tumor Society. Funding for research is continually leading to better treatments for brain tumors and the hope that a cure will eventually be found. Please join me in this continuing journey and the fight against brain tumors. I was incredibly thankful to have this world-class facility just a few miles down the street. Beyond the high caliber of everyone I’ve had the pleasure to encounter at Duke, the thing that impressed me most was their level of knowledge, skill, and teamwork. Their cutting edge research and technology gave me confidence that everything would work out. I would wish the same peace of mind for anyone diagnosed with a brain tumor. How can you help? PLEASE visit Ryan Robertson’s Crowd Rise page and make a donation. Any amount helps…lost for a number, 26.2 sounds good. This entry was posted in Uncategorized on March 19, 2017 by burk.brian@yahoo.com. Running a sub-four hour marathon in a dream location. There are some races that you size up and target for a good day. The elite runners call them goal or feature races. Coming off my second sub four-hour marathon at the City of Oaks Marathon in November, I wanted a spring race that would provide an opportunity to repeat that performance. 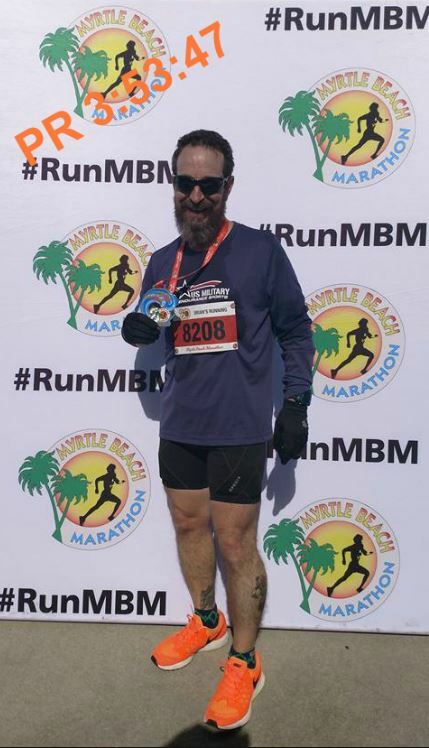 Myrtle Beach Marathon with is advertised flat and face course seemed like the perfect stage for another sub four or maybe even a new personal record. 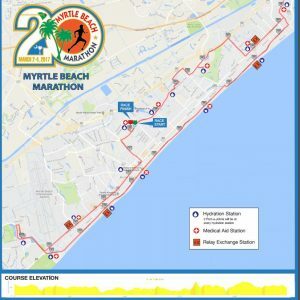 Myrtle Beach Marathon on March 4th become my feature race. Then the winds of fate had their say. With a fully loaded race calendar I opened the doors on the month of February on target and hopeful of a good showing in the March marathon. Then during a simple five-mile run my right calf painfully locked up for the second time in five days. It was if the cold hand of the Grim Reaper himself reached out and put the touch of death on my spring running plans. I was days away from a 40-mile mountain race and a month out from my goal race at Myrtle Beach. I thought for sure all was lost. With much uncertainty, and after three weeks off I nursed myself back and toed the line at 6:15 a.m. on a cold Saturday morning. I stood there in the corral amongst numerous others complaining about the cold. Also weighing on my mind was the fact that my longest run in the last four weeks had been a paltry eight miles. I questioned if I would get through this race in one piece. I also questioned if I would be smart enough to limit the damage if something did go wrong. One thing for certain I would find out soon as Myrtle Beach offers a flat, fast and fantastic marathon experience. FLAT - With Myrtle Beach’s relatively flat course I was thankful I would not have to put my calf to the test of climbing a lot of hills. From the get go the course lived up to its billing. What elevation changes the 26-mile course could offer up could have been measured with a 25-foot tape measure. At the end of this race I would not have the excuse that I lost time on the hills. In fact, during the race my main thought was wondering if my right calf would let me finish. If my wonky calf held up I was determined to not leave anytime on the course. FAST - Heralded as South Carolina’s fastest marathon course, I believe that statement to be 110% true. Outside of the already mentioned flatness of the terrain, there were no awkward sections of the course that I felt cost me time. Yes, there were a few out and back sections but those had wide sweeping turns that did not bog down my leg turnover or cadence compared to some races I’ve run where I had to downshift into first gear just to get thru the hairpin curve. If you’re looking for the BQ time or a personal record I can’t think of a better venue them Myrtle Beach. FANTASTIC – I had a great time in Myrtle Beach. From the expo, where for the first time I was there as a vendor promoting my recently release book Running to Leadville, to the starting area, the course, the finish and the local community support. Everything was spot on…normally at some point during my previous races there had always been a moment where I said “what the heck was the Race Director thinking?” But I failed to have that moment this weekend. My wife even commented that I did not have my typical race blow up moment this weekend. I honestly had a great time at this race. I met a lot of nice people at the expo, got to hang out with a great Running store with Roanoke Island Running Company, sold and signed a few books and ran the entire race without calf pain. 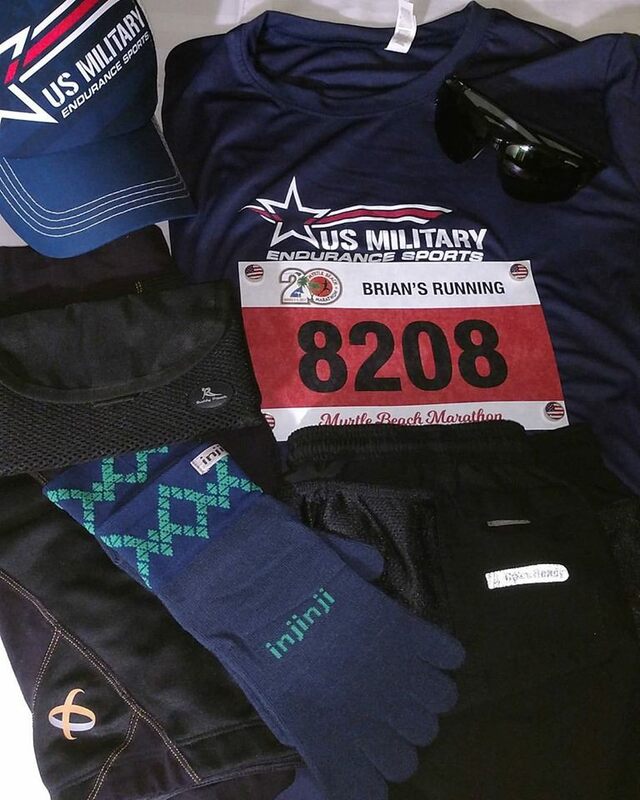 I had a FANTASTIC time in Myrtle beach and running the Myrtle beach Marathon. RESULTS: My calf was never an issue, I might have felt it around mile 8, or it may have been my mind playing tricks on me. I ran a perfect race, kept my pace under control, refueled before it began an issue, stayed on my hydration plan. The result…a marathon personal record time by over two minutes. I ran a 3:56:06 at the City of Oaks, at Myrtle Beach I bested that time with a 3:53:47 cutting 2 minutes and 19 seconds off my time. More rewarding for me was that I was able to back up my 2nd sub-four-marathon 3 months later with my third, SUB-FOURS back to back. When I posted on Facebook live how happy I was with my sub-four finish a number of running and non-running friends asked why I seemed so happy. I normally don’t judge my race times against others, or against established times by other runners. 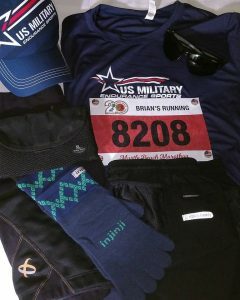 For me the sub-four marathon is the mark of validation that I’m a serious marathon runner, or serious runner in general. I’m not implying that this standard is a measure on others…it is a standard I impose on myself. It’s a point of validation for me and me alone. My thoughts on pre-race nutrition and race strategies on aid stations. EXPO: This was the first expo where I was part of the event. I had the great fortune to hanging out with Shane and the Roanoke Island Running Company who helped me make my book Running to Leadville available. I also got to meet a lot of great people. If you would like a signed copy you can get one direct by clicking here. This entry was posted in Uncategorized on March 8, 2017 by burk.brian@yahoo.com. I have found a running home in Wake Forest, Run-Tri-Outfitters. I’m proud to announce that I’ve teamed up with Run-N-Tri Outfitters to bring running to a new level in Wake Forest, NC. Look for updates and exciting news on the Run-N-Tri Outfitters Facebook page. Stop on out and visit the gang today…tell them Brian sent ya! This entry was posted in Uncategorized on March 6, 2017 by burk.brian@yahoo.com. Running a successful marathon or ultramarathon is so much more than just simply running the race. The training, mental fortitude, race day strategies, and nutrition are all keys to a successful day. In this post I’ll look at pre-race and race day nutrition. The week prior to the race I ensure I concentrate on hydration. Now I’m not saying that’s the only time hydration is important, I’m saying I really focus on it during this time. I also focus on eating better during this final week and cut out all alcohol. Now I don’t drink much by rule…but seven to ten days out I stop drinking altogether. The day “before” the day before (48 Hrs out), I concentrate on filling up the tank. I don’t count carbs or calories. I like to keep it simple. I have a good breakfast, a solid lunch and I ensure I get a good meal in with a little extra helping. I don’t pig out or go over board I just have a good sized portion maybe with an extra bread stick, slice of pizza, or second go at the spaghetti. .
Race day eve I again ensure I get in a good breakfast and a carb backed lunch. For dinner I like to have a good meal, pizza, pasta or on occasion a “breakfast for dinner meal, of pancakes or waffles. The night before I do not want to take on a “gut buster bomb” timed to maybe go off on the starting line or mid race. I talk about my race day nutrition on this YouTube video. Hope this helps…the important thing is to find out what works for you and to get the energy into in the tank so that you can run your best race. This entry was posted in Uncategorized on March 5, 2017 by burk.brian@yahoo.com.